House Taken" is an original symbiosis between nature and art in the mind of Colombian artist Rafael Gómezbarros. 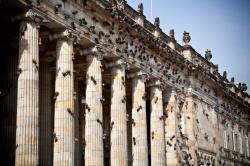 All it takes is 1300 ants that seem to have no moral inhibitions to take over any important monument around, this time being the building of the National Congress of Colombia. But do not get scared dear Yatzereaders, the goal behind it is to promote culture and open a debate about immigration, displacement and rootlessness. Rafael Gómezbarros’s Bogotá studio resembles a Tim Burton fantasy. 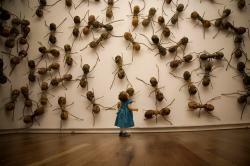 There are larger-than-life ants on the walls. Ants all over the floor. Ants on shelves. On the artist’s sunny terrace, next to crisp white patio furniture, are hundreds more, stacked like corpses underneath a large plastic tarp. The artist, who possesses an infectious laugh and smile, explains that what interests him about ants is their “duality,” which he represents in his work by creating ants with two different skulls, made from glass fiber and tied together with cotton. On one hand, as tenacious, hardworking insects, ants symbolize the resilience and good spirit of Colombians. 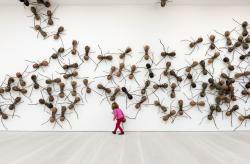 Gómezbarros uses ants to explore the negative issues that affect Colombia, such as displacement and migration. 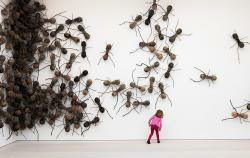 As insects that are constantly on the move, “ants live displacement,” he says. 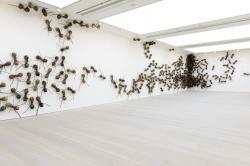 It is unclear whether the ants are the invaders or the invaded, another “dual” aspect that appeals to the artist.